Last week we posted part 1 of our Q & A with Dr. Scott Ashmon, editor of The Idea and Practice of a Christian University. Read part 2 below! Part 3 can be read here. Explain the concept of vocation and its significance to the Lutheran educational system. The doctrine of vocation teaches that every person has multiple callings in life (e.g., parent, child, worker, citizen) and every (honorable) profession and role is a calling from God. Moreover, God works hiddenly through people’s vocations to love and serve others. This is true for Christians who recognize that God has called them through the Gospel to be His holy, priestly people (1 Peter 2:9–10) and continue to live out their vocations (1 Corinthians 7:17). It is also true for non-Christians who do not recognize God’s callings (Isaiah 44:28–45:1). The purpose of every vocation, then, is to love and serve the neighbor. This idea directly applies to and guides the vocation of a university; vocations within it—administrator, professor, student, staff, regent; and all vocations students prepare for in their education. This teaching counters anemic views of vocation that relegate it to the work of clergy or professional occupations. It helps students see that everything with which they engage in their education can and should prepare them for their multiple vocations in life. In this light, a liberal education that prepares students to be, as Luther says, “wise, honorable, and cultivated citizens” is just as important before God and the neighbor as an exemplary professional education. In fact, focusing exclusively on professional education or any one major diminishes students’ capacity to fulfill all the vocations God has and will give them. Society and the church need well-rounded citizens who can address life’s multiple challenges and assume its multiple roles. A truly vocational education, in a Lutheran view, is one that prepares students for the whole of life, for service to all of their neighbors in family, work, church, and community. What is the most significant challenge to the Lutheran higher education system? What prevents Lutheran universities today from fulfilling the beautiful vision of education implicit in their own theology? A few issues are worth considering. One, Lutheran universities may have forgotten—or never learned—the riches of their own theology and how these apply to the university. This is a problem that this book seeks to remedy. Two, Lutheran universities may have sidelined or abandoned this vision in an effort to satisfy secular university standards, recruit more students, and secure other funds after the river of denominational students and funds dwindled to a rivulet. Three, as Lutheran universities expand to educate more students for more vocations in society and the church, they need more Lutherans with terminal degrees in diverse disciplines willing to take up the holy calling of professor. Unfortunately, these are in short supply. As a result, Lutheran universities must increasingly hire professors from other Christian bodies. 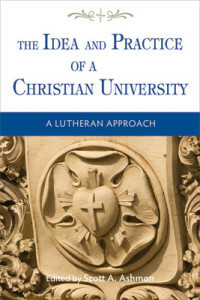 Here, the Catholic historian James Burtchaell rightly observes that “although it is the vocation and mission of the Lutheran venture in higher education that most counts, Lutherans are likely to be the only people who could be committed to it enough to dedicate their careers and lives to it.” Lutheran universities need more Lutheran professors. How can Christian universities in general and Lutheran universities specifically position themselves to remain relevant for the future? Relevance needs to be seen in light of God’s two kingdoms. To remain meaningful to the left-hand kingdom, or, put loosely, society, (Lutheran) Christian universities must be engaged in the world—which is God’s by virtue of creation and redemption—and its problems, its ideas and expressions, its search for temporal solutions, its vocations. They need to be of common cause with secular universities in pursuing and living out truth, knowledge, wisdom, virtue, beauty, and a good society. To remain relevant to the right-hand kingdom, or, loosely, the church, (Lutheran) Christian universities must serve the church. The typical question today is how can the Christian faith sustain the life of the mind? But the longer-standing question has been how can the university support the church? In other words, how can literature, history, the arts, business, the social sciences, and the whole host of university disciplines use their disciplinary knowledge, methods, and skills to help illumine and advance the church? How can the university help the church better understand and live out its left-hand kingdom cultures and operations? How can it help the church fulfill its right-hand kingdom calling of proclaiming the Gospel to the world? To do both well, (Lutheran) Christian universities need to be conversant with both society and the church, academic disciplines and theology.